I love Almond Oil Pure Castile Soap by Dr. Bronner's Magic Soaps smells delicious! Best Price! Shipped fast and packaged well! Great unisex almond scent, The best Natural soap! I bought Almond Oil Pure Castile Liquid by Dr.Bronner's Magic Soap to make shampoo with. Like it so far. Revitalize your mind and body with the heavenly scent of Almond Oil Pure Castile Liquid Soap from Dr. Bronner’s Magic Soaps. This organic product contains tocopherol and oils of coconut‚ olive‚ hemp‚ and jojoba. Oils of coconut‚ olive‚ hemp and jojoba reportedly retain the moisture content of the skin‚ reduce the appearance of pores‚ and give an even tone to your face. They may provide important nutrients to your skin‚ fight microbial infections‚ and prevent dryness. The presence of these oils in this liquid soap from Dr. Bronner’s Magic Soaps may cleanse your skin mildly and retain elasticity. Tocopherol could potentially provide antioxidant protection and keep your skin looking moisturized‚ resilient‚ and youthful. Natural almond fragrance may add a wonderful aroma to your shower and impart a refreshing feel. Use Almond Oil Pure Castile Liquid Soap from Dr. Bronner’s Magic Soaps and it may gently cleanse your skin‚ while keeping it soft and moisturized. 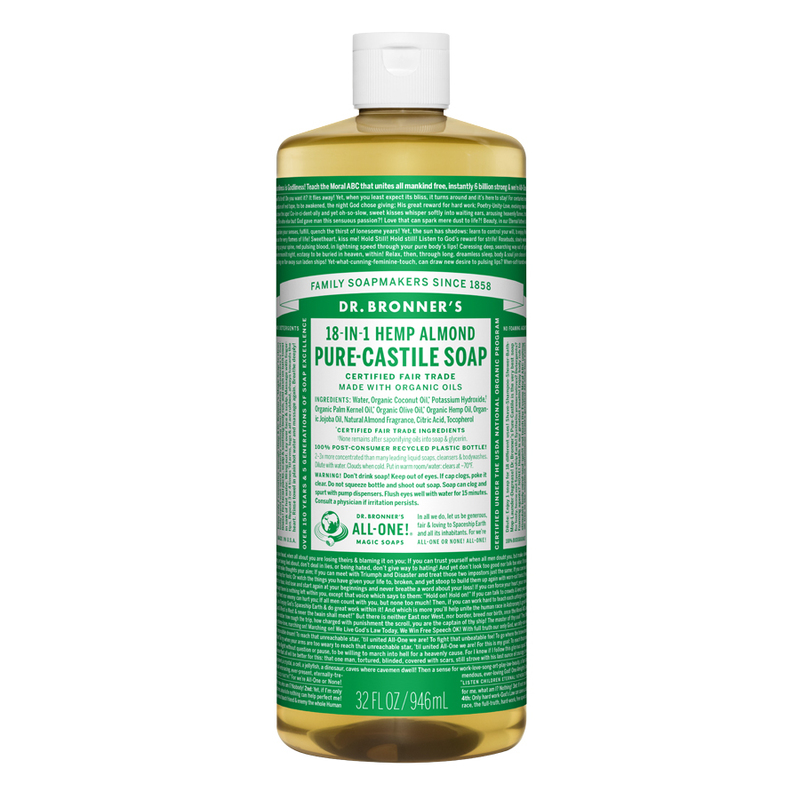 Dr. Bronner's Almond Oil Pure Castile Liquid Soap is great! I use it to make the foaming soap. It has the cleanest smell!! I love Almond Oil Pure Castie Liquid Soap by Dr. Bronner's Magic Soaps. From shampoo to toes...the best. Will order again. Softness - Fragrance - Purity. Really, what's not to like about Almond Oil Pure Castile Liquid Soap by Dr. Bronner's Magic Soaps!? Usage list goes on and on. General cleaning, dishes, hair, pets.... not certain where you cannot use it. I'd like it to come with a spray top also when using full strength.... I think. I was amazed by the smell of Almond Oil Pure Castile Liquid Soap by Dr. Bronner's Magic Soaps it has a sweet scent that lingers after showering. It all natural ingredients makes it shake to use on your face as well as your body. It helps clear skin blemishes. And I also used it to mop the floor and wash dishes. Almon Oil Pure Castile Liquid Soap is another fragrance to love in the Castile liquid soap line!! Smells great and makes a nice sud. Almond Oil Pure Castile by Dr Bronner's Magic Soap smells great and gets really sudsy. Works for body wash, shampoo, and even for shaving. Tried it initially for washing my dreads (since it's more natural/doesn't leave residue) and haven't gone back to anything else! Great product and a little cheaper than I can buy locally. Like the fact that this does not have the stripping effects on the hair that commercial shampoos do. Gentle pure smell is so wonderful!! Dr. Bronner's is the best all natural, all purpose soap for your hands, body, and more. I use Almond Oil Pure Castile Soap as a body wash and love the subtle natural almond smell of it. How much Pure-Castile soap do I mix with water to make an enema? Hello Judith, thank you for contacting PureFormulas. We suggest contacting the manufacturer for more information on ways to use Castile Soap.